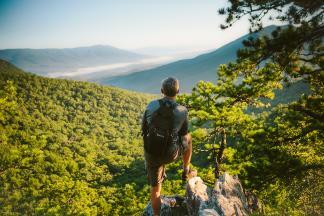 Mountains aren&apos;t the only terrain with outdoor adventures in the Roanoke Valley in Virginia&apos;s Blue Ridge Mountains as the region also boasts a fantastic assortment of water sports. A great way to explore during your Blue Ridge Day is by paddling on one of the many rivers, streams and lakes that meander through the region&apos;s valleys and mountain passes. Between cool, mountain streams, exciting rivers, one of Virginia&apos;s largest lakes, and even a fun-filled water park, you&apos;ll want to remember to bring your swimsuit when you visit Virginia&apos;s Blue Ridge. With cool, clear water below and sunny skies above, you&apos;ll love the blueways of Franklin County and the Upper James River in Botetourt County. There&apos;s also easy access to kayaking and paddleboarding on the Roanoke River Blueway. Spend a day on the water at Carvins Cove, where the peaceful surroundings will make you feel like you&apos;re a world away. For paddling and boating, Smith Mountain Lake has rentals for motor boats, fishing boats, pontoon boats, house boats, sail boats, canoes and kayaks. With over 500 miles of gorgeous shoreline, boating is one of the most popular activities at Smith Mountain Lake. Learn more about Smith Mountain Lake boat rentals. The following is a list of water sports outfitters and spots in the region where you can enjoy an aquatic adventure.